DID YOU HEAR ABOUT BISCUIT DAY? 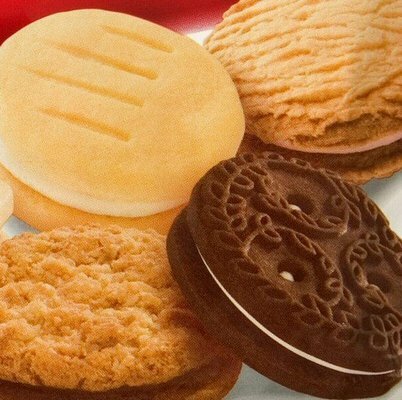 Did you get the school notice about ‘Biscuit Day’? No, probably not, because it only came home to our house. As a response to the increasing number of packed lunches that include too many biscuits, snack foods and foods that are not nutritionally-rich (such as white bread), the school will be implementing a new ‘healthy lunch box’ policy from the beginning of Term 2. More details will be provided about what can and can’t be included in your child’s ‘healthy lunch box’ later this week, however, in preparation we ask that for the remainder of the term, you implement a strict ‘healthy lunch box’ routine with your child. It is understandable that the new approach will be met with some resistance. Therefore, we have decided that once a term we will have ‘Biscuit Day’, when children can bring biscuits, snack foods and white bread as part of their lunch. Note the date: April 1st. Yes, for the first time ever I played an April Fool’s Day joke on my kids. I went to great lengths; the notice above was printed on school letterhead that I cut and paste from an old notice. I also added some random folds to the page, so that it looked as if it had been pulled from the bottom of the school bag. As we drove to school, their lunch boxes bursting with fruit, vegetables and bread of the extremely fibrous variety, I informed them that they’d been fooled. And they loved it. They loved the lengths I’d gone to with the notice and that they’d believed in Biscuit Day. They might not have been loving it so much at lunchtime when their friends were tucking into BBQ Shapes but I’m glad they can appreciate a good joke (and a good biscuit, if they’re lucky enough to get one). This entry was posted in Parents and tagged Biscuit day by jacquitomlins. Bookmark the permalink.